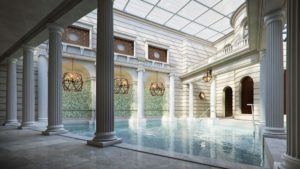 The spa at The Gainsborough Bath Spa features natural thermal waters from the ancient Hetling Spring in Bath, England. Amy Laughinghouse, August 9, 2017. No Comments on Bath gainsborough spa village pool1.